Top 5 Best AR-15 Manufactures. That’s a good question, but also technically complicated. Saying “AR-15” is like saying “Pickup Truck”. Asking for the best Pickup Truck would require me to respond with “What are you going to do with it?” It’s far easier if I know the specific applications you are going to use it for, because of all the options and configurations out there. And with AR-15’s there are far more nuances that go with them. So instead of specific models, I’m going to simplify this. I’m going to list in order specific manufactures. Companies that are making production gun sold through dealers… not custom guns. These are the only production AR-15 Rifle Makers that I would personally spend my own money on. Reason I picked these are due to the overall quality and consistency that I have seen. These guys are consistently putting out the best products. Each one of these Brands are worth exploring. Which specific rifle – depends on your application or the configuration that you are looking for. These are also companies that I have personally talked with and know there commitment to putting out top quality rifles. There are a couple other companies out there that could have made this list as a Runner Up – but I just don’t like their finished products… I’ll give you one example. Black Rain. They are making some good products. BUT. Their finishes are ghastly and they insist on using a muzzle device that you could seriously use to drill through layers of sedimentary rock and discover oil with. They have to ship them with a rubber cap over it because the muzzle device will chew through the packaging during shipping. They WILL tear the crap out of any case you put them in as well. For what purpose do you need that for? It’s just tacky. If they would tone it down – I could take them more seriously. So if I had to pick just one rifle, that would be it. This is my person AR-15. I’m not done tweaking it yet. I’m going to shoot some Olive Drab Green on it, a little brown on it, and some MagPull Flat Dark Earth… But I’m in no hurry to do so. I’ll select color and pattern after I move to NC. Get the local colors there. Going all FDE isn’t going to do me a bit of good out there. And I’m not going to do it in anything fancy like Ceramic empregnated polymer or epoxy based resins or teflon infused bone. None of that. Krylon. Spray on, rattle can, Krylon. Why? To remind me… that this rifle is a Tool and not a Precious Keepsake. The wear on the Krylon will be viewed as Training Badges. Scars gained in activities that develop and teach skills. Also, I’m going to order a drop in trigger for it – because, to be honest, the trigger is Meh. I was going to order a popular now trigger that starts with a G and no one can pronounce the name the same way twice. But instead, I’m going to order one from “Black Rain”. They have a solid adjustable unit that lets you tune it. I like that. Instead of taking the time to order put parts together, I just started out with an off the shelf rifle. I selected a Daniel Defense DDM4V7 Light Weight. Then Joe at Crusader Weaponry installed the BattleComp muzzle brake and hit the Bolt Carrier Group with a Permanent treatment of Crusader Weaponry’s SLIPSTREAM lubricant. Makes the gun run slick and snot, and it feels like a .22LR when shooting. Here you can see the BCG better. The Slipstream gives it a satin grey finish… nothing flashy or “pimped out” about it. It’s just slick. If you hand cycle it slowly, you can actually feel the bolt lock and unlock within the action. 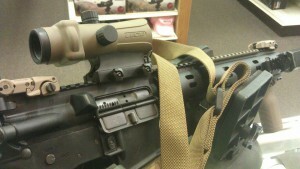 On top of the rifle is the Lucid HD7 Gen 3 FDE optic. Backing it up is a set of MagPul flip up sights… which is kinda pointless as the Lucid is bullet proof and the batteries last forever. 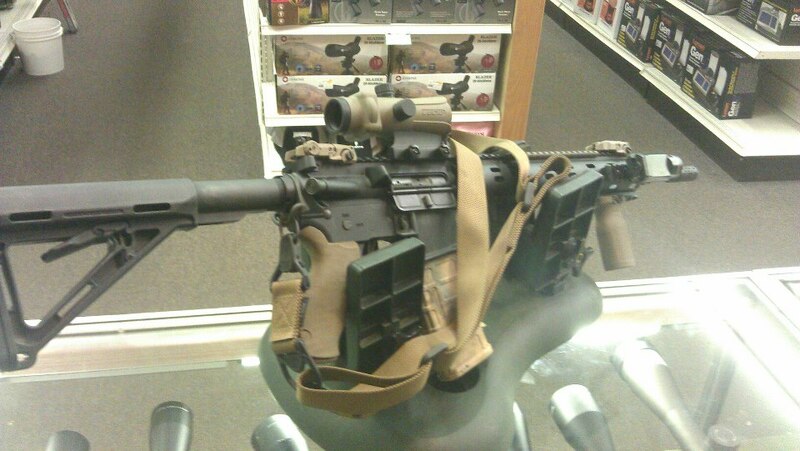 I’ve thought about putting an upgraded optic on it… something “Better”. But looking at the so called better options… I’m really not seeing any Red Dots that qualify as tangibly better. I’d have to go all the way up to the Trijicon SRS… and those suckers retail for over 900 bucks, for only some sort of perceived “Betterness”. Yeah, I’d rather spend all that extra coin on ammo. If I do switch off this optic… it would only be for something that was magnified Perhaps in a 1-4 variable. But to be honest, nothing as really sold me to justify the swap. Vortex has a PST 1-4 something or other that looks cool, but has huge unprotected turrets that can easily get spun unintentionally. Forget that. Yeah, I’m happy with the Lucid HD7’s. They define “Bang for the buck” value.